The California Fish and Game Commission is deciding whether to designate the great white shark as an endangered species. 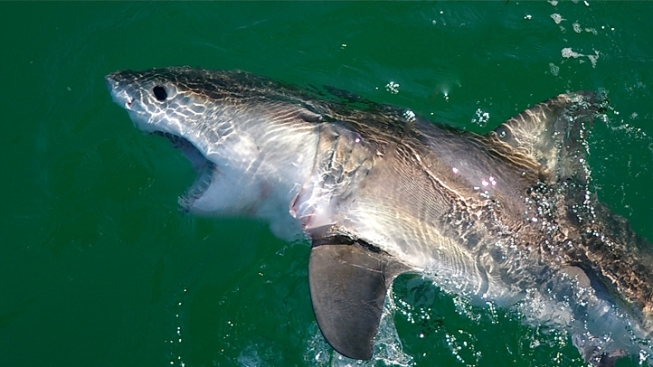 this juvenile great white was released into California waters in 2012. The California Fish and Game Commission on Wednesday will decide whether to take the first steps toward designating the great white shark as an endangered species. The vote is in response to a petition from three environmental groups that says that there are only 339 remaining great whites in the Northeastern Pacific region. Moreover, the petition says, those sharks that do live near the coasts of Central and Northern California have high levels of mercury, DDT and other chemicals in their bodies. The shark population has suffered for a variety of reasons, the petition said. Young animals are frequently caught in fishing nets, the groups said. In addition, the state’s population of sea mammals such as sea lions and seals has been greatly reduced, and these animals are natural prey for the sharks. As a result, the sharks have less to eat, and more difficulty surviving. If the commission decides to begin the process to declare the sharks endangered, it will not happen immediately. The move to designate an animal endangered takes about a year. The groups behind the petition are the Center for Biological Diversity, of San Francisco, Oceana, of Monterey, and Shark Stewards, of Forest Knolls. The Fish and Game Commission meeting can be seen via livestream at the agency’s website. The petition can be read here.